I recently finished reading the book entitled "Creating your path to a policy career" published by the Institute for Humane Studies. Targeted at young people aspiring to advance the causes of liberty and free market economics, the book is a very useful read for anyone wishing to make advancing liberty their career. The book, however is equally useful for anyone (non free marketers too) wishing to make a career in public policy. Written in clear , simple language , it covers topics like the structure of social change and role of think tanks, skills essential for a career in policy world, roles with in a think tank, steps necessary to kick start your career, ways of changing or influencing policy making outside of think tank etc. Each chapter of the handbook is written by someone with an expertise in a particular aspect of the public policy world, which has added much to the usefulness and relevancy of the book. In the world of public policy, integrity or character is the most valuable asset anyone can have. "Integrity is more important than all the good grades or degrees you’ve earned, more important than all the management courses you could possibly take, and more important than all the knowledge that you could absorb on any subject. It’s something over which every responsible, thinking adult has total personal control, and yet millions of people every year sacrifice it for very little. It will not only define and shape your future, but it will also put both a concrete floor under it and an iron ceiling over it. It’s what others will more likely remember you for than your looks, your talents, your smarts, or your rhetoric. If you lose it, it will taint everything else you accomplish", says Lawrence W. Reed, the President of Foundation for Economic Education, one of the earliest free market think tank in USA. Good writing skills is a must. A career in policy world involves a lot of writing regardless of whatever your role is. "Writing is not just for the blogger, the op-ed author, and the novelist. It is also the absolutely indispensible tool of the fundraiser, the recruiter, and the manager", says Mr. Matt Mitchell, a research fellow at Mercatus Center. There is no such thing as a typical day in a think tank. Process of influencing policy decisions doesn't have a well-defined set of activities or a path. You'll have to be perform various roles ranging from an op-ed writer to fundraiser to mail dispatcher to event coordinator which implies anyone choosing a career in public policy has to be flexible and must love changes and various roles. Policy world is more of an adventure than a well trodden path. Higher degrees in economics or political sciences are very valuable. A PH.D. in economics or political science is well respected in the policy world so are Masters degrees in these disciplines whereas degrees in other disciplines aren't as valuable by themselves but are valuable in respect to the contribution they make to your work. But any degrees is less valuable than the quality of your work. Policies of any field always has something to do with economics due to the cost and benefit that comes attached with any public policy. So, understanding of economics is necessary for personnel involved in the policy world. "Economic thinking allows policy professionals to ask the right questions, thus helping good thinking to overcome some tempting policy errors that are made every day", says James D. Gwartney, Professor of Economics at Florida State University. Like economics, politics is another indispensable aspect of any public policy. So, an understanding of politics really helps while advocating for or against a policy. Too many times, bad policies get enacted solely for the reason that their lobbyists have a good understanding of politics and use it to their advantage. Statistics are seductive. It's necessary for a policy professional to have a good command of statistical tools and analysis.However, statistics represent just information not knowledge.It's important that statistical information aren't misused to serve vested interests. The secret of convincing people to your thinking lies in your persuasion and issue framing skills. In the political world, people aren’t stupid because they’re stupid. They’re stupid because they’re smart. And if we try to make them smart, we’re being stupid! Think Tanks accommodate several roles and backgrounds. Think tanks accommodate roles that range from academicians to journalists to managers to researchers. No matter what is your background, you can still contribute to the world of policy. Policy analyst, policy strategist, communications specialist, investigative journalist, researcher (academician), blogger, op-ed writer , networking expert are some of the common roles in a think tank. There are many ways to influence policies besides working in a think tank. Working for a think tank isn't the only way you can influence a policy. 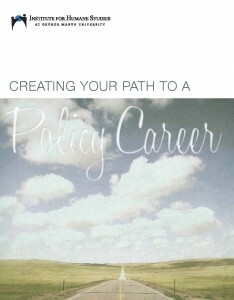 There are various professions you can choose to influence policy decisions in your country. You can influence policy decisions by being a professor, businessman, politicians, author, op-ed writer, activist or any other profession. However, working for a think tank gets you in the forefront of the battle of ideas. Note: The book is freely available for download. Click here to download the book. An open letter to the people of Egypt !